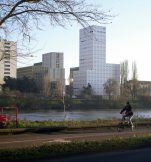 Lan architecture office has just delivered the 360° View Tower, a panoramic 18-story tower in Nantes, France. 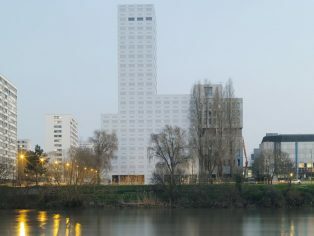 This new housing building is located on the Brossette site, which completes the transformation of the Boulevard Vincent-Gâche, with the largest project ever built on the Île de Nantes. This 1.5 hectare lot facing the Loire River will soon be home to a total of six new buildings, with mixed-use programs. LAN originated from the design of a master plan and the grand urban principles underpinning this project, and with the oﬃce as the lead contractor of a consortium of architects who have worked on this ensemble in order to adjust forms and dimensions able to house the program while strengthening the design of the public space. The site is at the intersection of several formal systems: buildings dating from the 1970s condominiums based on the model of large housing projects or “estates,” an oﬃce complex with courtyards and gardens which was never entirely completed and the intervention of Alexandre Chemetoff, architect of the ﬁrst phase of the islands urban renewal. This heterogeneous context called for an approach bringing greater cohesion, as proposed by Anne-Mie Depuydt and Marcel Smets, the urban planners in charge of the Île de Nantes. Thus, the new buildings enclose the public space by creating fronts. Despite the fact this lot is entirely privately owned, all the outdoor spaces are open to the city. The district having become an entirely pedestrian zone is traversed by a central avenue; the backbone of the island, it leads to the core area of the project : a broad plaza in front of the tower, now renamed the “360° View”, will become a public plaza ceded to the city. The 360° View Tower represents the end and the beginning of the Brossette block. 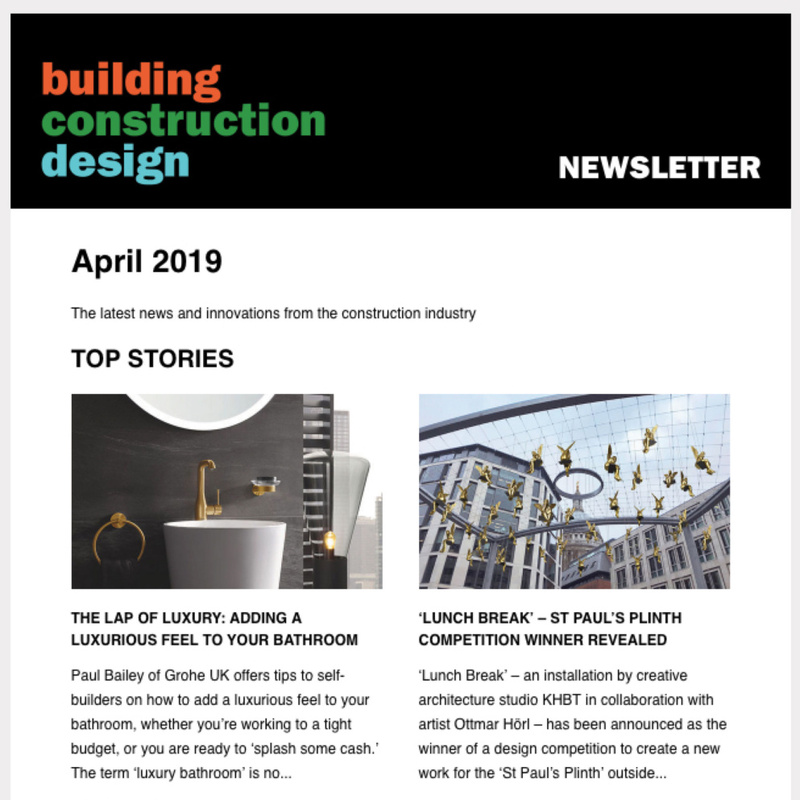 The building is the highest of all those comprising the Brossette city block, culminating at 55 meters with 18 stories above the ground ﬂoor. 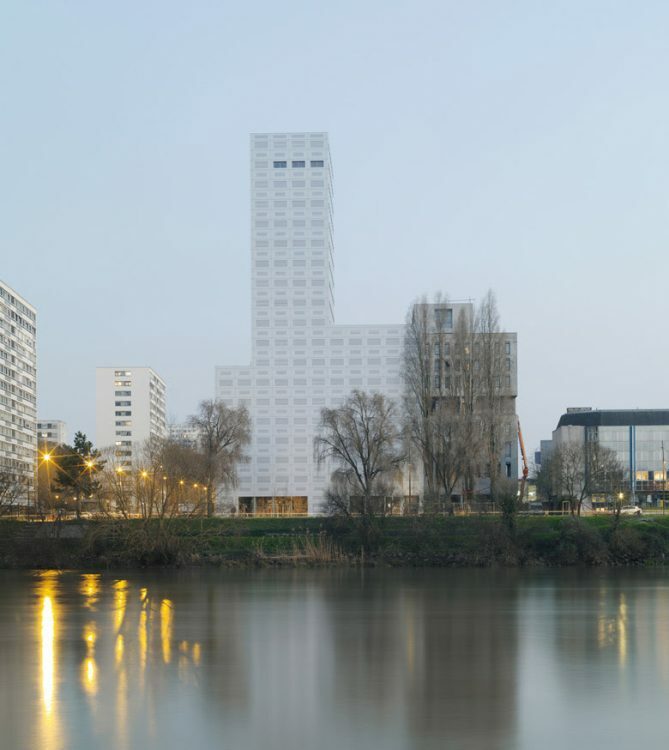 The 360° View Tower takes full advantage of its height, opening broadly onto its context and especially onto the Loire River and the city’s historic center. The building serves as a signal for the development. The project is located on the northern end of the lot. It contains 79 apartments as well as commercial space on the ground ﬂoor. 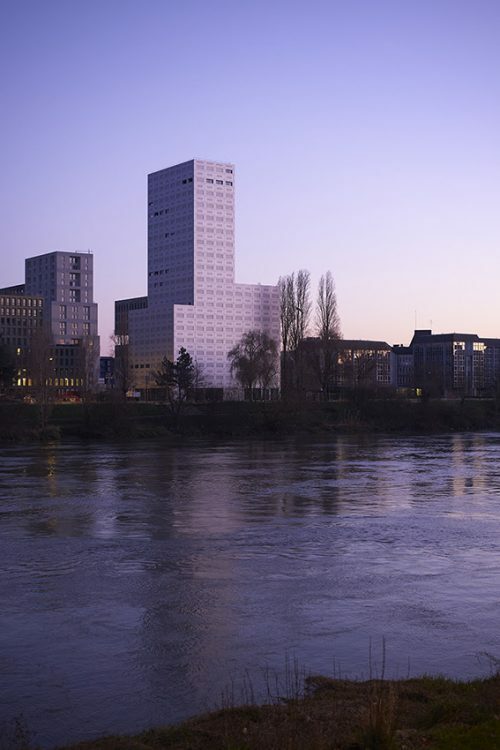 Beneﬁting from its exceptional location on banks of the Loire, 84% of the apartments offer views overlooking the river, the remaining part (16%) being oriented in a southerly direction overlooking the Place Brossette. 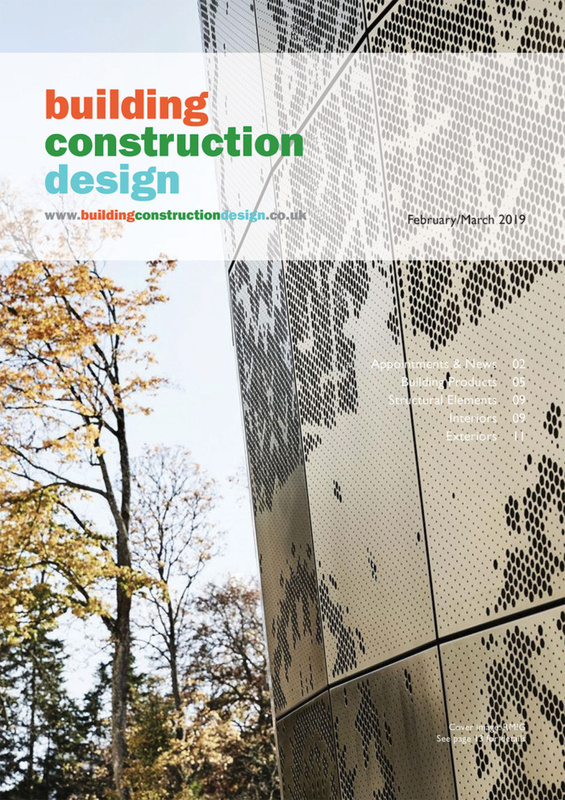 The building’s structure (stress-bearing facade + column and beam) allows for great ﬂexibility in ﬂoorplans, the distribution of typologies being adaptable according to the requirements of future buyers. 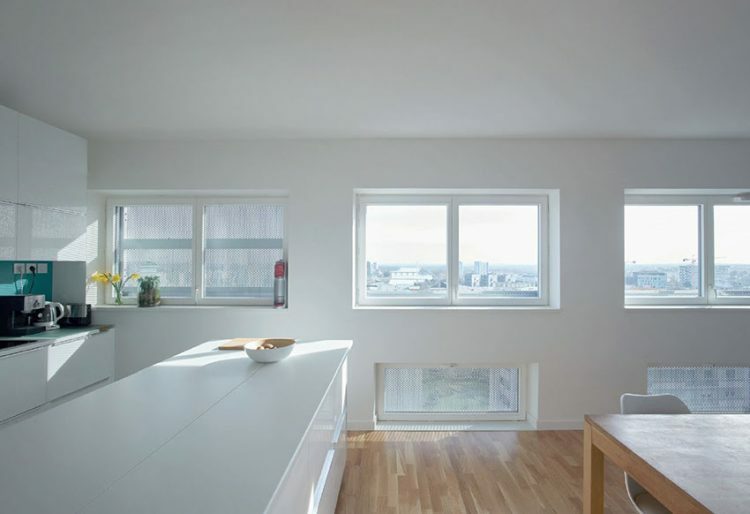 The ﬂoor space dedicated to the housing part of the program amounts to 4,821 m² of usable ﬂoor space. Most of the apartments beneﬁt from spacious loggias, extending living areas toward the outside. Each apartment is organized around a large loggia, a genuine extension of the interior living space toward the outside. They are set back from one floor to the next. In summer, these loggias help ensure ventilation of the apartments. The ﬁxed cladding and the sliding shutters guarantee the privacy of loggias and offer protection from the wind. Program : unrestricted affordable and social housing units, student residence, offices, Vatel school, shops, parking.